My husband calls it, “fancy restaurant food” when I plate the dish and garnish it and drizzle this or that over the top. So, this fancy restaurant meal comes from humble beginnings, was really easy to prepare, and was super tasty! Sometimes, inspiration comes from whatever is in the ‘fridge and needs to be used up. Vons had asparagus on sale the other day for 99 cents a bunch. So of course, I had to buy some. But that also means I had to use them up before they went bad. There are always eggs in my fridge. And, I often have spinach. So, I looked around in there and found a few goodies, including some sweet and soy dressing that was already made. This dressing is a snap to mix together, so even if it wasn’t already made, it wouldn’t take much to throw it together. And, the taste is so great; it just seems to go with everything. This dish will work for so many restricted diets… pescatarian, gluten-free (use G-Free tamari sauce), low-carb, diary free, vegetarian (just leave the tuna off), or even for people with no dietary restrictions. Here’s the way I put this dish together. Though please feel free to add in whatever you have in the ‘fridge or whatever is on sale at the store. 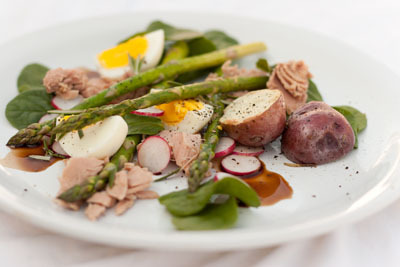 Tuna, asparagus, red potato, and hard-cooked egg with sweet and soy dressing. Preheat the broiler to 450° F.
Place prepared red potatoes in the same skillet with the asparagus and place under the broiler until asparagus are until lightly browned and tender when pierced with a fork, approximately 10-15 minutes (time will depend on the thickness of the asparagus). Remove the asparagus from the oven once they are done, place on a separate plate and set aside. Check the potatoes for doneness by piercing with a fork. They will most likely need to go back into the oven for another 10 minutes, or until tender when pierced with a fork. Once cooked through, set the potatoes on the plate with the asparagus. While the asparagus and potatoes are roasting, boil the eggs (see Boil an Egg instructions). Peel the egg, and slice into quarters. Set aside. To plate: Scatter half of the spinach leaves on each of two plates or shallow bowls. Sprinkle with radish slices. Flake the tuna and scatter half on each plate. Place about 5 to 6 asparagus stalks on each plate. Place the egg quarters on each plate. Drizzle the salad with sweet and soy dressing and garnish with rosemary leaves and additional salt and pepper. Enjoy! *Cook’s Notes: The fatter asparagus stalks are better for roasting than the skinny ones. You will have leftover roasted asparagus, as the whole bunch isn’t used in this dish. The leftover ones are great with pasta, or in a frittata. **Chunk Light Tuna is usually skipjack, a small tuna with the strongest fish taste of the tuna varieties. It can also include yellowfin. The variety of tuna typically isn't labeled on the can. Chunk Light has a more pronounced flavor, and more pink color than albacore. It's best for use when the tuna flavor should shine through, such as a nicoise salad or no-cook pasta sauces. Light tuna contains omega-3s, but in smaller quantities than albacore. It's low in mercury due to the fact that the fish is younger and has had less time to accumulate mercury than the older whiter albacore tuna. Chunk Light is a great choice if you are concerned about mercury levels. Whisk together all ingredients (or shake in a jar with the lid on). Add salt and pepper to taste. You will have more dressing than you need for this asparagus dish; the remaining dressing can be kept refrigerated. Always shake well again just before using.